2019 will be the year of app retention. Here’s how machine learning can help. Ten years into the iPhone and global App Economy and all the rules have changed. For nearly a decade, app makers focused on app downloads and installs, the lower-funnel activity that powered staggering growth in the early days of the app store. Now, this focus has shifted due to a dawning realization that sustainable success is the result of a strategy that drives engagement and activity deeper in the funnel. The focus has rightly shifted to app retention. A defining moment was the observation by mobile measurement company Adjust, which found that on average users delete apps 5.8 days after they used them last. 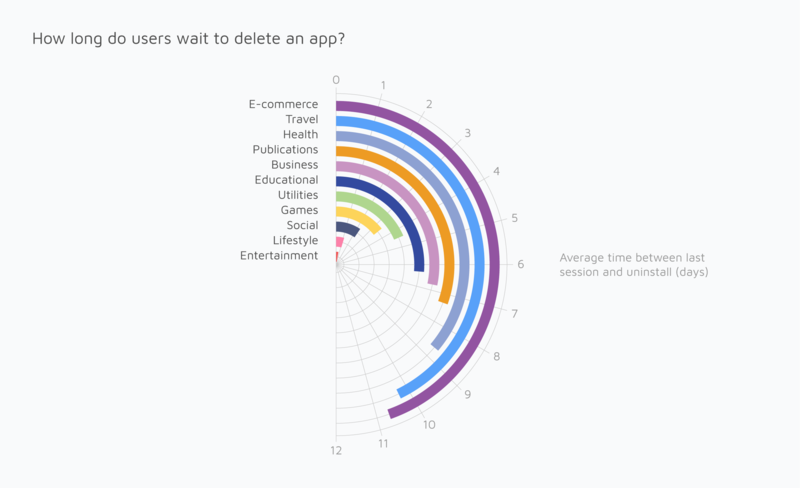 Significantly, Entertainment apps have the shortest lifespan, with users deleting this app category less than one day following their last session. Graphic based upon an Adjust analysis of 8 billion app installs from January through July 2018. What’s worse, the average app loses its entire user base within a few months. Media apps may offer fresh content to nurture engagement, but even that appeal can grow stale. A recent report that provides an overview of Media and Entertainment engagement and retention metrics reveals 43% abandon the app a week after they install it and 67% of users churn within two weeks. Indeed, 2018 will go on record as the year our fascination with the hockey-stick growth of the global App Economy as measured in app downloads (pegged to grow globally from 205 billion in 2018 to 258 billion in 2022) was replaced by the sober realization that the average retention rate for mobile apps plummets after just the first three days. It follows that 2019 will be the year we see an avalanche of interest and activity aimed at finding new and better ways to encourage app engagement, app retention, and drive lasting loyalty. In the online marketplace, a single-digit increase in retention can mean a double- or even triple-digit increase in profits. When it comes to marketing and monetizing apps, the advantages of offering the appropriate campaign at the appropriate moment can equally significant. It’s a given that effective marketing is personal and relevant, aligned with who your consumer is and understanding of their individual needs. However, apps introduce a new dynamic: activity. To deliver marketing and messaging users will accept and appreciate, marketers must also segment audiences according to what they have or haven’t done in-app. Unfortunately, the work required to segment audiences and – more importantly – market to each user segment differently has moved beyond human capacity. It requires marketers to sift through billions of data points (trillions if you count the input from the smartphone sensors). That’s where machine learning can play a major role. It has the capacity to weed out human bias and help marketers open the aperture of how they view and engage their audiences. Right now, marketers tend to operate according to rules. If users haven’t done x in the app for a certain period of time, reach out with y message via the channel that makes the most sense (push, in-app messaging, text, email, social). But without a deep understanding of who the audience is and what will bring them back (insights that emerge when marketers wield all the data, not just 5% of it), the outcome—even if it is personalized to address the user by first name—has many similarities to one-size-fits-all marketing. Good marketers are clearly customer focused and likely have a strong intuitive sense of their customers’ behaviors. However, they will undoubtedly achieve greater success by understanding the vast amount of customer information that digital makes possible. This is the first step to architect strategies that will allow them to achieve customer intimacy at scale. Engagement is emerging as “the” performance metric that matters across the every stage of the marketing funnel and every step of the user journey. But keeping users active and interested remains the biggest puzzle marketers have yet to crack. That’s where machine learning shines. It gives marketers a much greater ability to tailor engagement approaches to specific audiences, even specific customers, based on the probability that they are very likely, likely and even less likely to churn. The opportunity and ever-present challenge of mobile is its intimacy. To retain customers, every offer, incentive, “nudge” in the desired direction must strike a personal note.